Ask any dyed in the wool Walt Disney World fan, “What would you consider a Gatebuster attraction?” and you can almost guess what they will say. The answers will likely range from Toy Story Midway Mania to Soarin’ to Tower of Terror and so on. We all know which attractions are the hottest; we have all stood in the lines. “Gatebusters” are those attractions that bring the crowds in, in droves; they leave people wanting more; no matter how many times you are there, you feel the need to do it again and again. While many first time Walt Disney World visitors may not be aware of it, The World also has a long and distinguished list of Gatebusters that you will never have the opportunity to “ride.” This is because they are not truly attractions, they are restaurants. In these days of preplanning and automated reservation systems the average Walt Disney World traveler may find him/herself out of the loop when it comes to getting the dining reservations they seek. Some dining offerings are simply so incredibly popular with those who are “in the know” that, coupled with limited seating, makes ADRs (Advanced Dining Reservations for us lay folk) at these establishments, a hot commodity. Along the course of this series, we are going to explore some of these Gatebuster Dining opportunities, and see what makes them so very popular and why you must take advantage of the 180-day ADR window. What better place to start our journey than deep inside the iconic centerpiece of Walt Disney World itself, Cinderella Castle. This table dining experience is like no other in the world, let alone on property. 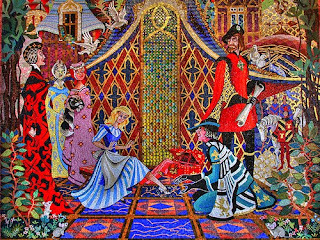 As you enter the main entrance of the castle and proceed down a long corridor you will find five gothic style arches, each emblazoned with beautiful mosaics which tell the story of Cinderella, what better way to set up the wondrous story behind the dining experience you are about to partake in. Once you are in the Royal Dining Hall, the meal is more about the atmosphere and the experience than it is about the food. The hall is rich in detail, with stone walls and stained glass, the walls bear shields with family crests upon them (look closely and you may even notice the Disney crest). The cast members greet the adults in the party as Lords and Ladies, while the youngsters will be treated like royalty and called “prices & princesses.” As you walk past suits of armor, you are escorted toward the dining hall. The main dining room has a high domed ceiling with flags, tapestries and large chandeliers hanging from it. All of which reassure you that this is not your “run of the mill” dining experience. Once seated you will be visited by a number of characters, The Fairy Godmother, Lady Tremaine, Anastasia, Drizella and, of course, Cinderella herself. Half the fun is the interactions between the characters themselves. We met Cinderella before entering and posed for photos with her, once inside the interactions between Lady Tremaine and the Step Sisters kept us entertained throughout most of the meal. While we found the menu enjoyable and well prepared, we had a selection of breakfast staples to choose from with the French Toast being the culinary star of the show, the real reason for a return visit would be to sample to atmosphere again. With the ADR window of 180-days again, you will certainly need to take full advantage of it. In order to get your preferred seating you should plan on making the call to Disney Dining precisely 180 days out from the first day you will be staying at a Walt Disney World Resort. If you are off property you will need to be sure and book 180 days out from your desired meal date. 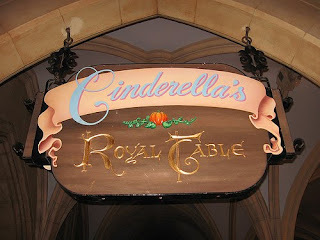 With so many dining offerings available at The World, Cinderella’s Royal Table continues to stand the test of time and be one of the great “Gatebuster” dining experiences to be had. I suppose it has something to do with the fact that nowhere else could you dine with story book princesses and be treated like royalty, right in the heart of a magical, fairytale castle. Hooray! Can't wait to find out your thoughts on Gatebuster dining opportunities! I agree on Cindy's -- it may be a bunch of fiberglass, but the restaurant truly looks and feels like a castle. And the prime rib for dinner ain't half bad.